We are in February but Barcelona staff are constantly active. They are already thinking about summer signings and doing their homework. They are putting a list of players together who they might want to sign but now Fekir and Aouar are not on it. 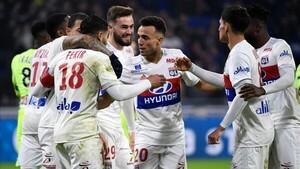 The Lyon midfielders were being locked at but ultimately Barcelona have decided that they are not good enough. Nabil Fekir has been linked wit hbarcelona a lot. They like his talent and his potential, but the problem is his position. Barcelona have a lot of players with a similar profile to the French-Algerian. Even without Arthur coming, Coutinho's arrival more or less shuts the door to him. The case of Houssem Aouar is different. He is a young player, 19, and Barcelona don't see him ready to compete at the level they need him to. Although the club has made some moves nearer to him, they will not bite the bullet and buy him.